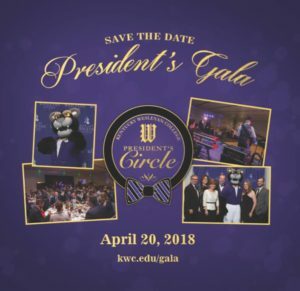 Join us in celebrating all things Kentucky Wesleyan at the 3rd Annual President’s Gala on Friday, April 20. The annual tradition is black-tie optional and includes live entertainment by The Downtown Band from Nashville, a cocktail reception with hors d’oeuvres, a plated dinner and remarks from President Bart Darrell. Members of the President’s Circle, KWC’s annual giving society for those who give $1,000 or more annually to the College, will each receive two complimentary tickets. Additional tickets for the 3rd Annual President’s Gala are also available for purchase by non-President’s Circle members for $75 each. Non-members may purchase tickets here or email advancement@kwc.edu or call 270-852-3142. RSVP and ticket purchasing deadline is April 6.